Lex sits in his limousine, just inside the gates of Arkham Asylum. His Lois Lane robot sits next to him. Lex is reading the Gotham Gazette, and grumbling about the headline that says "BRUCE WAYNE FUNDS BATMAN!" As Lex ponders his strategy to obtain the Black Ring energy, his assistant Spalding attempts to interrupt with a newsflash: some of the news stories and science articles that motivated Lex's quest may have been planted. The Lois-bot steps in to prevent Lex from being bothered by this news, at least for the moment; as Lex prepares to interrogate the Joker. Once inside Joker's cell, Lex finds the interrogation quite frustrating. Joker's behavior is jocular, maniacal, and irreverent, while Lex is serious and intense. When Lex senses he is being mocked, he throws a hard punch that sends Joker tumbling out of his chair. Lex is about to leave, considering the entire exchange pointless; when Joker invites him back and agrees to be a bit more cooperative. The conversation resumes. Lex asks pointed questions to find the location of the black sphere; what he calls an unusual energy source. Joker answers each question with a riddle. Lex easily solves the riddles, as if interpreting from "Joker-speak" into regular English. The cat-and-mouse game continues a while longer. Joker has a couple of jars in his prison cell. Joker opens one, revealing a toy pony. Subsequently, after Lex tries the tactic of actually asking nicely, Joker grabs another jar and opens it to reveal the small black sphere that Lex is looking for. When Spalding suggests that Luthor and his team just take the sphere, Joker objects vehemently. Joker wants something in return for the black sphere. But as Joker rambles on, pontificating on subjects from the meaning of the universe to the nature of the black sphere; it appears that what Joker really wants is merely an audience. Finally Lex comes straight out and asks Joker what he wants. Joker replies that he wants Lex to increase the size of the sphere. Joker intends to use it as a doorway; to leave his prison cell. Spalding then succeeds in expanding the sphere by feeding it with additional energy. The sphere begins to behave unpredictably, expanding, and then rather suddenly and explosively turning pure white. Joker has second thoughts, and decides to stay in his cell. Joker continues to utter nonsense, and then Lois-bot pushes Spalding into the white sphere. Spalding screams in pain and then disappears. The white sphere shrinks back down to its small size, and Joker puts it back in the jar. Joker rambles some more; then Lex leaves with the jar containing the white sphere and Joker cackles with glee. In a Las Vegas casino, two armed security guards talk as if they can hear someone inside of the walls that house their computer system. They discover a hole in the wall; and when they look inside, they find Larfleeze, the Orange Lantern. Larfleeze says he is looking for Lex Luthor; and specifically he is looking to obtain what Lex is searching for. Story - 2: This issue is a mixed bag. It is strong on characterization, but weak in plot development. Also, there is a major flaw, which I will address shortly. CHARACTERIZATION: I enjoyed the cat-and-mouse game between Luthor and Joker in this issue. There is a "welcome to the fun-house" quality to this story, which is typical for any story featuring the Joker. As they are preparing to meet, Luthor and Joker are described as "polar opposites"; and this is certainly accurate. In their interactions in this story, we see what we already know; that Luthor is controlling, but Joker is uncontrollable. For Lex everything is science. Every problem can be solved if you happen to have Lex's genius. For Joker, the universe is irrational and chaotic. For Lex, everything is serious business; for Joker, everything is rollicking good entertainment. Paul Cornell does a good job of contrasting these two extreme and interesting characters. I loved Joker's twisted theology; where Joker asserts "If the universe is meaningless... that's a joke at our expense. If it's meaningful... a different joke. Any meaning we make ourselves... that's us pretending we're in on it." Only Joker could see the universe this way. As a character study, this issue succeeds. PLOT: But as a story with a plot that makes sense, this issue fails badly. Too many plot details make no sense at all. Why does the black sphere happen to be in Joker's cell? Where did Joker's jar collection come from? As a prison inmate, shouldn't he have restricted access to such "toys"? What is the source and the meaning of the "magic pony"? Why does Joker just assume that Lex will be able to expand the sphere? And in response to Joker's request, why is Spalding able to expand the sphere so easily? Upon expanding, why does the sphere turn white? Why does Lois-bot push Spalding into the white sphere? Just to see what will happen? When Spalding goes into the sphere, shrieks in pain, and disappears; is he gone for good? I doubt it. I expect him to simply pop up somewhere else. And that will make about as much sense as the rest of this story! As much as I enjoyed the character study and the interplay between the two evil geniuses, these plot details made no sense at all, and kept pulling me out of the story. MAJOR FLAW: The wrong person is starring in this book! 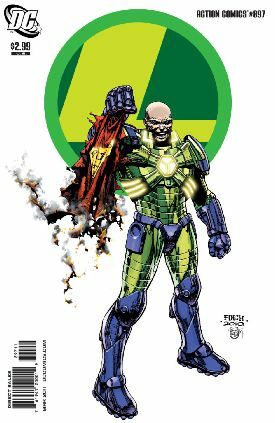 If DC Comics decided to give Lex Luthor his own book, that would be fine with me. But the hero who starred in Action Comics #1 way back in 1938 should be starring in Action Comics today! This should be Superman's book; yesterday, today, and tomorrow! I am impatient to see the rightful star of this book return! DC Comics tells us that Superman will be back in Action Comics beginning with issue #900. That is certainly long overdue! CONCLUSION: I found the interplay between Joker and Lex interesting and amusing. I would rate this story a "4" if I based it solely on character interaction. But I found the illogical plot details annoying and infuriating; and would rate this story a "1" if my rating was based solely on the strength and reasonableness of the plot. And of course the major flaw, the absence of Superman, earns a big fat "1". So I averaged those three scores, and arrived at the rating of "2" that you see here. I will rejoice when Superman is back in this book. Art - 4: Pete Woods is always a crowd-pleaser. His images of Luthor and Joker are spot-on. In many images, Joker looks theatrical, as if he is really enjoying his own "performance". Lex often appears as if he is simmering with annoyance or anger. Just look at the panel right after Lex decks Joker. You can see the rage on Luthor's face when he says "Do not laugh at me!" Cover Art - 3: This cover is in keeping with the theme running through the covers of all the books this month: white background, a portrait of the main character, and a larger-than-life logo. We see Luthor posing in his battle suit, holding the remains of a facsimile of Superman's cape as it burns. The effect of the smoldering cape is well done, and the battle suit looks good. But Luthor's face does not look right. It has too many dark lines, as if wrinkled and obscured in shadow.